Ashes of Laughter: Fauna Tapir Pillow Giveaway! I want to win this pillow because I'm in the process of redecorating my room and orange is such a different color. It could help me decide what colors I'm going to do. I should win this pillow because it would be perfect in my room this fall once I start fashion school! I never go for color schemes, so I would definitely toss this spicy pillow amongst my black and white polka dotted comforter and hot pink sheets! It would definitely add a pinch of spice to my room! Sooo....PICK ME, please! Haha! yay giveaway! this pillow would be a great pop of color in my guest bedroom! PS. It is a fabulous pillow and would look great in each and every room in my home. That pillow is so cute. Im subletting a place right now in Brooklyn and it's just killing me that I can't fully decorate it in my own way. This pillow has so much character and would add a nice pop to the living room. Just found your blog and love it. Good job! I think I should win the giveaway because my/our 21st bday is approaching soon. I also know how much you miss me and that i was one of the first followers of ashesoflaughter, and a dedicated one at that! I also have a perfect orange chair that sits in my room so the orange from this pillow would definitely pull that color in with my "hippie chic" bedding, and i'm looking for new and improved throw pillows since i've had the same ones since FRESHMMANN YEARRR EWE! Love yaa! i am your follower since a long time ago, and this is my email. i should win this pillow because i've been looking for a unique pillow for quite some time and this is an answer! i'd love put this in my couch, the couch is waiting for this! I should definitely win this pillow because I think I could use it in my NY summer sublet with new bedding and permanently in my soon-to-be apartment as of August. So when you come visit me (on the flight you already have) you can see your little tapir sitting on my bed or on a chair in my room. 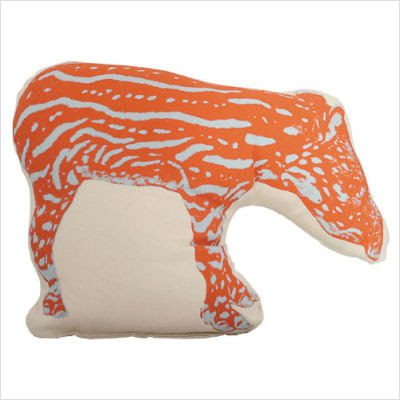 I should win this lovely tapir pillow because I think it would open me up more to the idea of embracing contemporary decor. Also, because I love you and am following you on twitter now! It will always remind me of your creativity and wonderful taste. I think this pillow is adorable! I love the orange and the animal shape. I am an interior design major at UGA and I am looking for a great pillow to go on my new chair in my bedroom. I love it!!! I love how the pillow will give a modern take to any room... preferably, my room! hehe. OH! I love animal PILLOWS!!! Especially Orange, yellow and blue ones!! I should win this eccentricchic lil accent because I just bought a new white couch from Pottery Barn and its sooo NAKED!!!! This would look so cute and quirky in the corner!! I am so excited about your blog EBASKIN!!!!! cheers, im off to follow you on twitta. i follow this blog. I would love to win this pillow. i am in the process of redoing my bedroom in orange and gray. This pillow would be an amazing addition!